What Is Rosacea? What Causes Rosacea? Rosacea is a chronic, inflammatory skin condition which principally affects the face. Rosacea causes facial redness and produces small, red, pus-filled pustules (bumps). Rosacea worsens with time if left untreated. It is often mistaken for acne or eczema, or some other skin allergy. 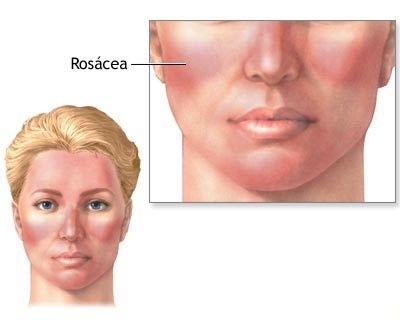 According to Medilexicon’s medical dictionary, rosacea is ” Chronic vascular and follicular dilation involving the nose and contiguous portions of the cheeks; may vary from mild but persistent erythema to extensive hyperplasia of the sebaceous glands, seen especially in men in the form of rhinophyma and of deep-seated papules and pustules; accompanied by alt-coins.top telangiectasia at the affected erythematous sites.” Approximately 1 in every 20 Americans – 14 million people – are estimated to be affected with rosacea. As it is frequently misdiagnosed the incidence may be a lot higher. A Gallup survey revealed that 78% of Americans do not know anything about rosacea, its symptoms or what to do about it. Rosacea is more common among fair-skinned people of northern European ancestry. However, studies have revealed that its incidence in many parts of Asia, including the Middle-East, South Asia, and China is growing, especially in regions that have undergone socioeconomic development in recent years. This has triggered speculation that lifestyle may be a risk factor, and not just skin color. Others say incidence has grown in those areas because healthcare and diagnosis techniques have improved. This is usually the first sign of what many call pre-rosacea. Flushing episodes can last as long as five minutes. The blush can spread from the face down to the neck and chest. Some people say the skin feels unpleasantly hot during flushing episodes. Sensitive blood vessels dilate very easily to topical triggers (touch), and some other physical stimuli, such as sunlight. Many mistakenly refer to this as “sensitive skin”, but with rosacea it is sensitive blood vessels and not sensitive skin cells which cause this. Sometimes the flushing episodes may eventually be followed by bouts of persistent facial redness. The redness, like a patch of sunburn, may not go away. This occurs because hundreds of tiny blood vessels near the surface of the facial skin dilate (expand). As the signs and symptoms of rosacea progress and get worse, small blood vessels on the nose and cheeks swell and become visible (telangiectasia) – they sometimes look like tiny spiderwebs. The skin on the face can become blotchy, similar to the skin of some alcoholics. However, it is caused by inflammation of tiny blood vessels in the surface of the skin, and not alcohol. People with rosacea may become concerned and distressed at being labeled hardened drinkers because of this. Although alcohol may trigger rosacea flare-ups in patients who already have rosacea, alcohol consumption is never the source of the condition. Severe rosacea can result in the thickening of facial skin, especially around the nose. The nose can become bulbous and enlarged (rhinophyma). This is a very rare complication, and tends to affect males much more than females. There is a burning, gritty sensation in the eyes, making them bloodshot. The inside of the eyelid may become inflamed (blepharitis) and appear scaly, causing conjunctivitis. Some people may not tolerate contact lenses and styes may develop. In very rare cases vision may become blurred. Approximately 50% of patients with rosacea experience some kind of eye irritation or symptoms. Excess fluid and proteins leak out of the blood vessels and eventually overwhelm the lymphatic system that cannot drain the leakage away fast enough. This results in fluid buildup in the facial skin. What are the causes and risk factors of rosacea? Skin specialists (dermatologists) suggest that a major factor is probably abnormalities in the blood vessels of the face, which cause the flushing, persistent redness and visible blood vessels. What causes the inflammation of the blood vessels is still a mystery. A much higher percentage of people with fair skin develop rosacea compared to other people. Demodex folliculorum lives on human skin and usually causes no problems. However, patients with rosacea have much higher numbers of these mites than others do. Experts do not know whether the mites cause the rosacea, or whether the rosacea causes the overpopulation of the mites – i.e. whether the high population of demodex folliculorum is the cause or the effect of rosacea. H. pylori, a bacteria found in the gut, stimulates the production of bradykinin, a protein known to cause blood vessels to dilate. Experts suggest that this bacterium may play a role in the development of rosacea. 30% to 40% of patients with rosacea have a close relative with the condition. Unfortunately, scientists do not yet know how which genes are involved and how they are passed on. Alcohol – alcohol does not cause rosacea, but it can be a trigger for people with the condition. Rosacea is not caused by alcohol abuse. There is no clinical test for rosacea. The GP (general practitioner) reaches a diagnosis after examining the patient’s skin, and asking about symptoms and triggers. The presence of enlarged blood vessels will help the physician distinguish it from other skin disorders. The presence of a rash on the scalp or ears usually indicates a different or co-existing diagnosis. Rosacea signs and symptoms are mainly on the face. Early diagnosis and subsequent prompt treatment significantly reduces the risk of rosacea’s progression. If the doctor suspects there may be an underlying medical condition or illness, such as lupus, blood tests may be ordered. The GP may refer the patient to a dermatologist. There is no cure for rosacea. However, there are various treatments which can relieve the signs and symptoms. A combination of medications and lifestyle changes generally give the best results. The doctor may prescribe camouflage creams that mask disfigurement of the skin. Treatment may involve a combination of prescribed topical medications (applied to the skin) and oral drugs (swallowing pills, tablets or capsules). Topical medications – these help reduce inflammation and redness and are applied to the skin either once or twice a day. They are commonly used in combination with some oral medications. Antibiotics (metronidazole), tretinoin, benzoyl peroxide and azelaic acid are examples of commonly prescribed topical medications. Oral antibiotics – for the treatment of rosacea oral antibiotics are prescribed more for the anti-inflammatory properties. Oral antibiotics tend to give faster results than topical ones. Examples include *tetracycline, minocycline and erythromycin. Isotretinoin (Accutane) – this oral medication is sometimes used for severe cases of inflammatory rosacea if other treatments have not worked. Isotretinoin is a powerful drug that inhibits the production of oil by the sebaceous glands. As side effects may be severe the patient needs to be monitored closely. Blephamide – a specific type of steroid eye drop which is sometimes prescribed for patients with ocular rosacea (eye symptoms). Eye drops are applied daily for three days to one week, followed by a break or tapered use. *Tetracyclines are not suitable for pregnant women or breastfeeding mothers because they can cause birth defects, and may undermine normal bone development in breastfed babies. As tetracyclines may also interfere with the efficacy of oral contraceptives a barrier method of contraception, such as a condom, should be used in order to prevent pregnancy. People with a history of kidney disease should not take tetracyclines. Tetracyclines can also make the skin more sensitive to sunlight. For patients with visible blood vessels (telangiectasia) laser treatment, which uses intense pulsed light, is used to shrink them. This will be done by a dermatologist. Although the procedure may cause some pain, most patients can tolerate it without the need for an anesthetic. Laser treatment can sometimes cause bruising, crusting of the skin, swelling, tenderness, and very rarely infection. These complications will usually disappear within a few weeks, although infection will require antibiotics. If the patient develops a bulbous enlarged red nose and puffy cheeks, and possibly thick bumps on the lower half of the nose and the nearby cheek areas, he/she may be referred to a plastic surgeon. Laser or scalpel surgery may be performed to remove excess tissue and remodel the nose. A carbon dioxide laser can also be utilized to shrink the tissue. When exposed to the sun wear a broad-spectrum sunscreen with a sun protection factor of at least 15. In wintertime protect your face with a scarf or ski mask. Try to refrain from rubbing or touching the skin on your face. When washing, apply a gentle cleanser to the problem areas. If your skin is sore use a moisturizer. Only apply moisturizers after the topical medication has dried. Do not allow yourself to get too hot. An electric shaver is less likely to trigger flare ups than normal razors. Built up a list of likely foods and drinks that may be triggers and avoid them. Avoid OTC (over-the-counter) steroid creams unless your doctor has included them as part of your treatment. In the medium or long term they may worsen symptoms. Stress – experts say stress is an important trigger of rosacea. Any measures to reduce stress levels will help prevent flare-ups and existing symptoms from getting worse. Steps to reduce stress may include regular exercise, getting at least 7 hours good quality sleep every night, and eating a healthy and well-balanced diet. As vigorous exercise is often a trigger, patients with rosacea are advised to do low-intensity exercise, such as walking or swimming. Yoga, tai-chi, breathing exercise, and some meditations may also help reduce stress. What are the possible complications of rosacea? If the rosacea affects the eyes the eyelids can become inflamed (blepharitis). Treatment involves a daily application of topical antibiotic creams, and/or oral antibiotics. Even though rosacea is not a life-threatening condition, its effect on appearance often leaves the patient embarrassed, frustrated, anxious, and lacking in self-confidence. Studies indicate that over three-quarters of rosacea patients are affected psychologically and emotionally.A National Rosacea Society survey revealed that the impact of rosacea goes far deeper than physical effects: it impacts the emotional health of sufferers. Forty-two percent of respondents with rosacea felt sad or depressed about the appearance of their skin, and more than half (55 percent) said rosacea was one of their top three physical concerns as they age, second only to weight gain (in a list that included wrinkles, high cholesterol and thinning hair). Rosacea patients also take steps to hide their condition. Nearly one in six respondents made excuses and stayed home from work/social events to hide their rosacea.Patients who are well informed about rosacea tend to cope better because they are well prepared to deal with complications or recurrences. Follow your treatment regime and all your doctor’s instructions carefully. Studies indicate that emotional health is generally restored when symptoms are successfully addressed – this is more likely to happen if you comply with long-term medical therapy and take measures to minimize the factors that aggravate your condition. It is important to talk to your doctor if you experience intense feelings of distress, embarrassment, or frustration. Talking to a counselor or medical social worker is also advisable. If there is a self-help group in your area you may find that talking to people who share your experiences and problems may help. If you have a flare up and find people staring at you, remember that few people know about rosacea. You can address this by explaining your rosacea and educating the starer. Staring is due to curiosity and ignorance.